Projects with many 2D lines are often overwhelming and hard to manage. You may find it easier to manage if you form smaller subsets or groups of 2D lines from such projects. 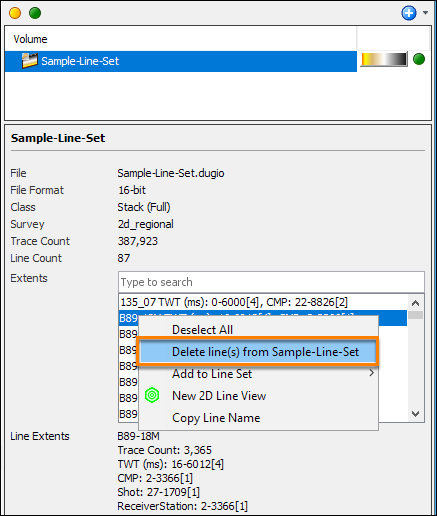 This can be done from the Survey tab by creating new 2D Line Sets and adding 2D lines using the following methods. In the Survey tab, click on the Add icon. Select New 2D Line Set. Type a name for the new 2D line set and click OK. In the Map View, hold Shift and click on any 2D line in the survey. You can also select multiple lines by holding Ctrl and clicking on multiple lines. Selected lines will appear in blue. 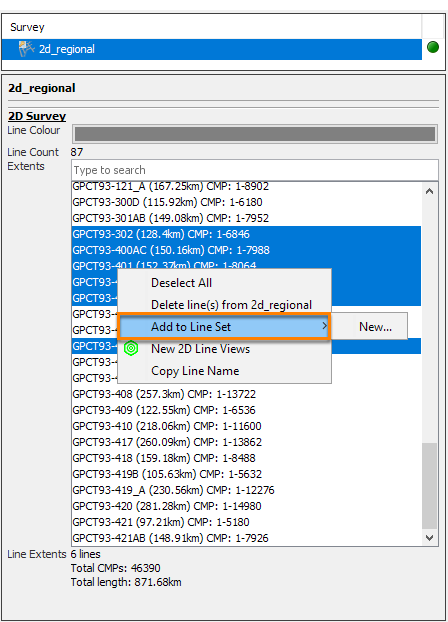 Right click and select Add selected lines to Line Set. You can choose to add the lines to an existing set or create a New set. From the Survey tab, select the 2D survey. 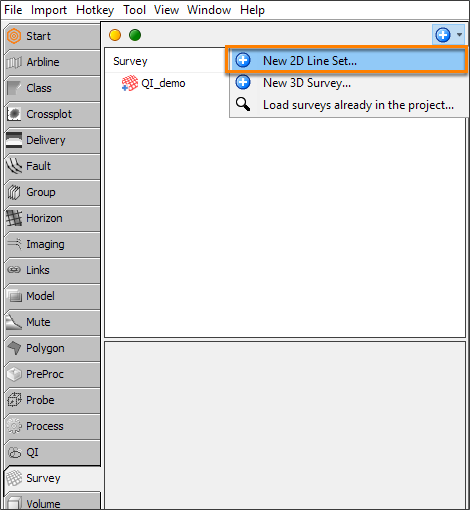 In the Details Panel, select any 2D line in the survey. You can also select multiple lines by holding Shift (to select a range of lines) or Ctrl (to select multiple individual lines) and clicking on multiple lines. Right click and select Add to Line Set. You can choose to add the lines to an existing set or create a New set. From the Volume tab, select the 2D volume. 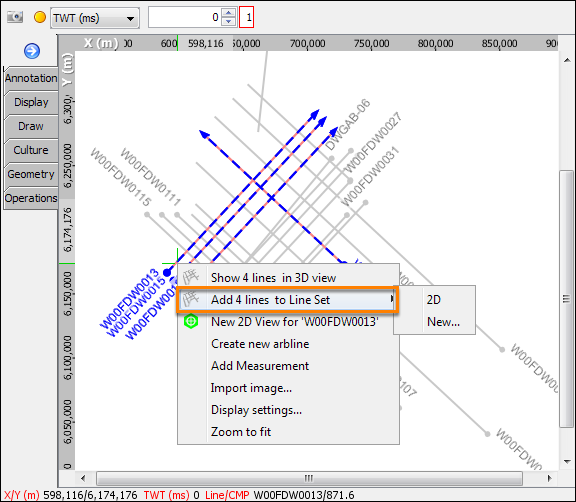 In the Details Panel, select any 2D line in the Extents box. You can also select multiple lines by holding Shift (to select a range of lines) or Ctrl (to select multiple individual lines) and clicking on multiple lines. Right click and select Delete line(s) from 'Line Set'. 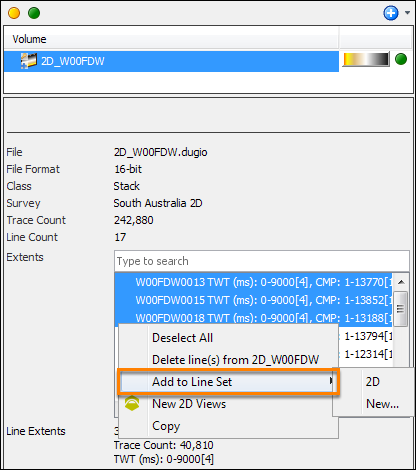 In the Delete lines from volume window, confirm the lines to be deleted and click Delete the data lines.